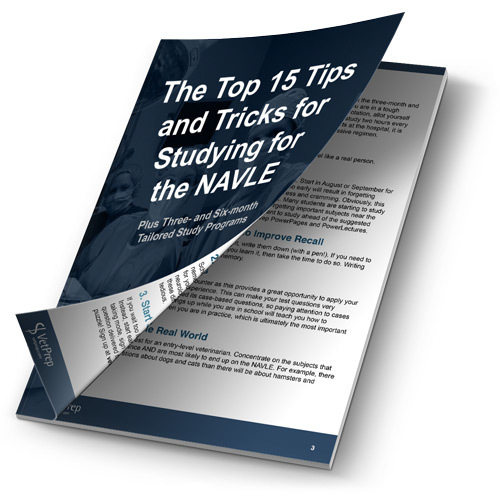 You're of course going to need to study a ton to nail the test, but there are a lot of tips and tricks that will help you make the most of your study time and we've packaged those up in a free guide. Just complete the short form and you'll be ready to roll! Also included as an extra bonus, TWO tailored study programs! NAVLE® is a registered trademark owned by the National Board of Veterinary Medical Examiners. This web site is not licensed by, endorsed by, or affiliated with the National Board of Veterinary Medical Examiners. © 2000-2015 VetPrep.com, Inc. · All rights reserved.